Yesterday I attempted cooking in our hotel kitchen again. It was the first 90-degree day of spring in Connecticut, so I decided it was a perfect day for hot soup. What makes you sweat only makes you cooler, right? No? That was terrible? Yeah, you’re right. I digress. While perusing Pinterest over the weekend, I came across this recipe for wonton soup. It sounded healthy and easy enough to make with the tools available in our hotel kitchen. Skillet? Check! Slotted spoon? Check! Dull knife and cutting board that has seen better days? Check and check! The first step was making the wontons. 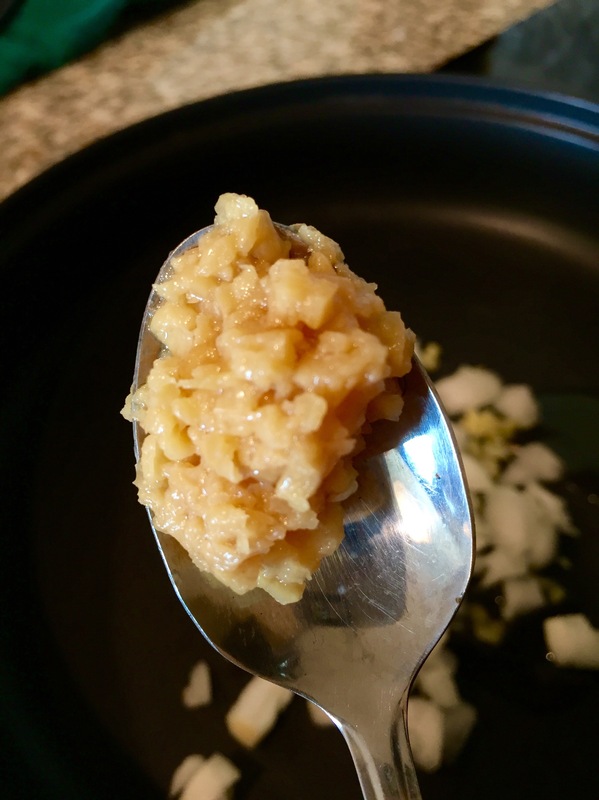 We didn’t have a grater, so I rough-chopped the fresh ginger. Not pretty, perhaps, but it actually worked pretty well. I threw that in a pot with olive oil (we didn’t think it worth picking up a whole bottle of sesame oil when we’ll only be here–hopefully–for a couple more weeks). Like my olive oil design? 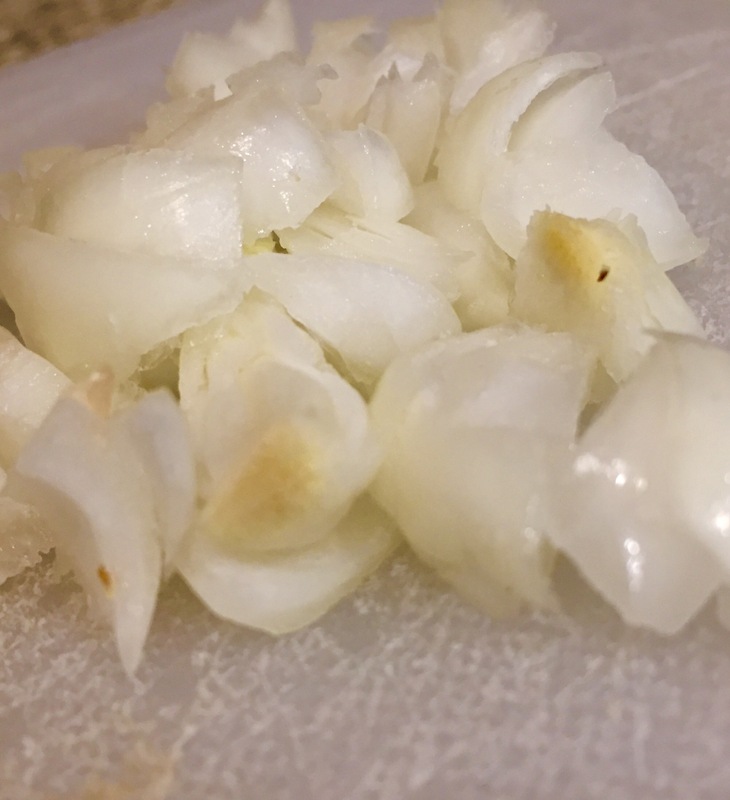 Instead of getting the green onions the recipe called for, I decided to use the cipollini onions we already had. Those also got a rough chop and were thrown into the skillet with the olive oil and ginger. Next, I added a healthy scoop of garlic. Our room will likely need to be fumigated after we leave to get the smell of garlic from the curtains, wallpaper and carpet. Désolé! Instead of shrimp, I opted to fill the wontons with ground chicken. While I can handle the smell of garlic permeating our room, I can’t deal with the lingering perfume of fish. 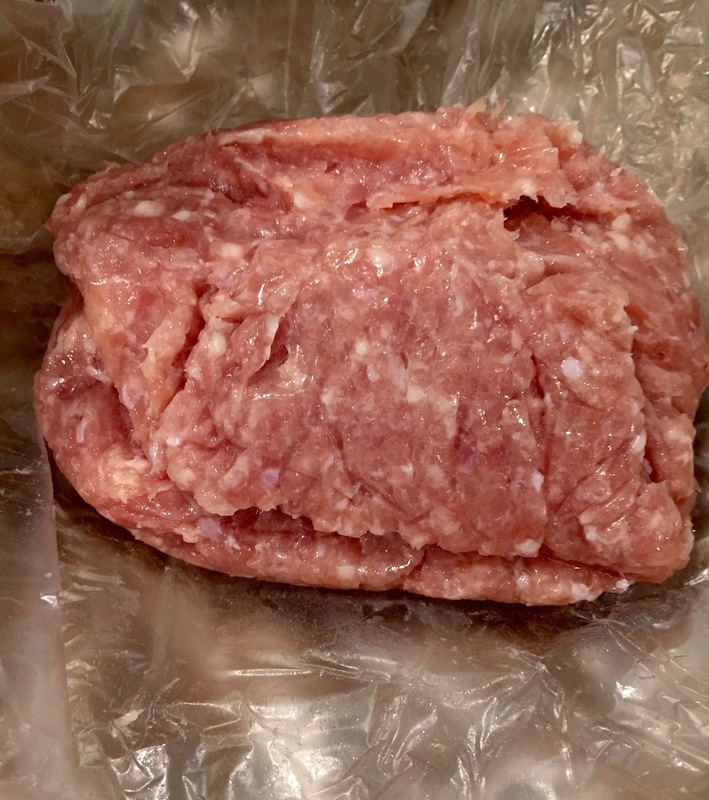 A half-pound of ground chicken was the perfect amount. The the recipe didn’t say it was necessary to cook the wonton ingredients before filling the dumplings, but I didn’t want to risk getting anyone sick at dinner, so I went ahead and cooked the meat until all the pink was gone. 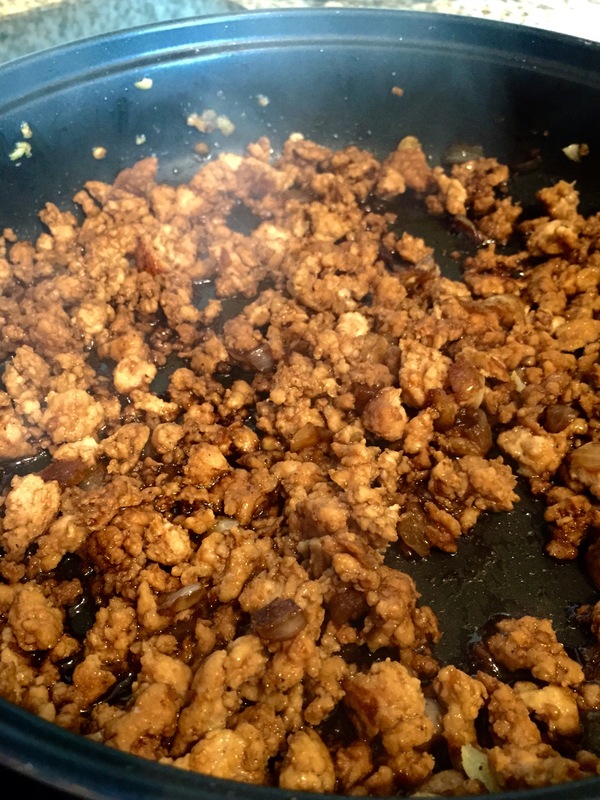 As it was browning, I seasoned it with salt, pepper, onion powder and soy sauce. Steamed dumplings are one of my favorite foods, but I had no idea how to fill and seal them. So, after my first couple of attempts ended up resembling a clumsy sausage, I searched YouTube and found this video showing me the proper way to fill and seal wonton wrappers. The picture below shows the amount of filling I put in each wrapper and what the uncooked dumplings looked like. It took about 20 minutes to fill all of my wontons. 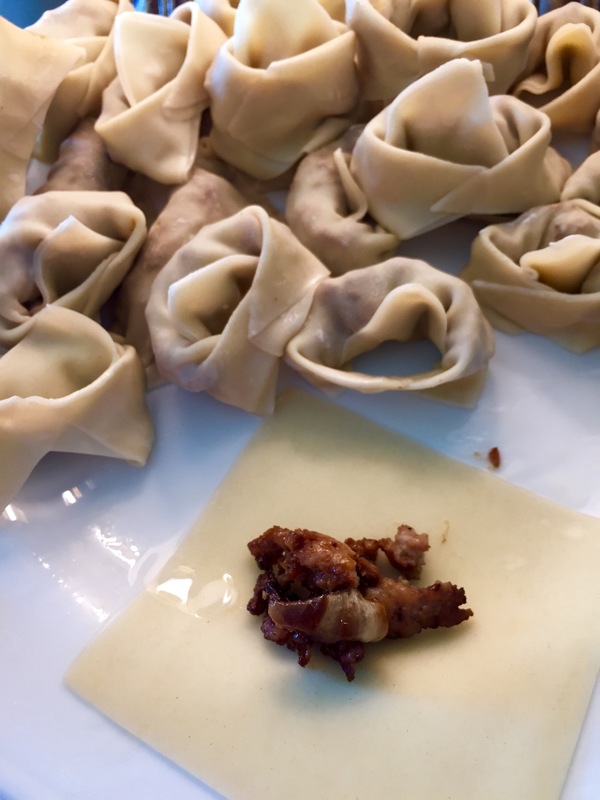 I had a bit of time before my dinner guests arrived (my husband and mother-in-law) and had a few extra wrappers, so I decided to experiment with a cheese-filled wonton. I cut a small chunk of fontal cheese, wrapped it up and dropped it in the skillet where I’d browned the meat. There was bit of oil and seasoning left from cooking the filling, so I hoped it would give this wonton a nice savory kick. Success! If grilled cheese had a delicious little cousin, a grilled wonton with fontal cheese would be it. Unfortunately it went in my mouth so quickly that I didn’t have a chance to take a picture. For the soup broth, I followed the recipe fairly closely. 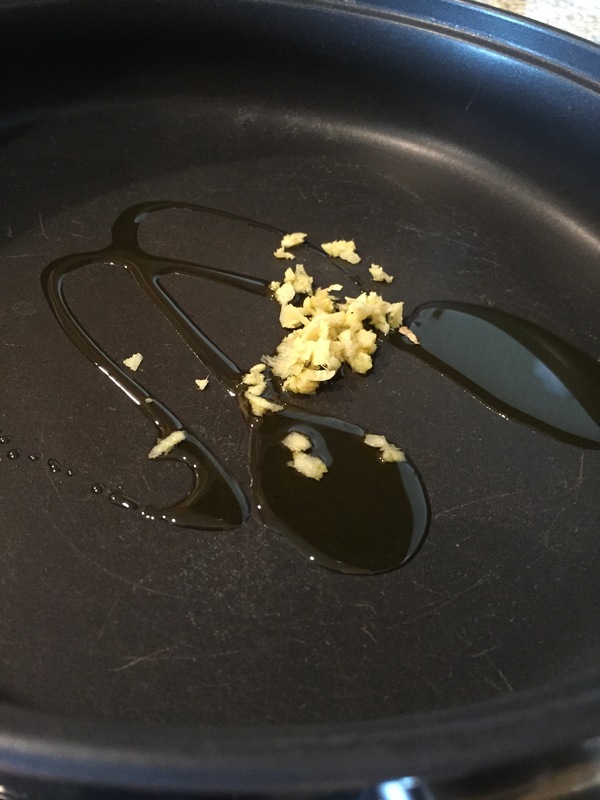 My only substitutions were another cipollini onion for the green onions and olive oil instead of sesame oil. Since our only big spoon was slotted, I served the soup by scooping it into bowls with a mug. We paired the soup with a delicious baguette from Mom, small salads and, of course, a glass of wine. The soup turned out pretty good despite my substitutions. The conversation and company were even better. Today I’m considering attempting chocolate-covered, frozen bananas. It’s the closest I can come to baking and who doesn’t love a chocolate-covered banana? Wish me luck! Nice I made wonton soup too but without the leafy veg! 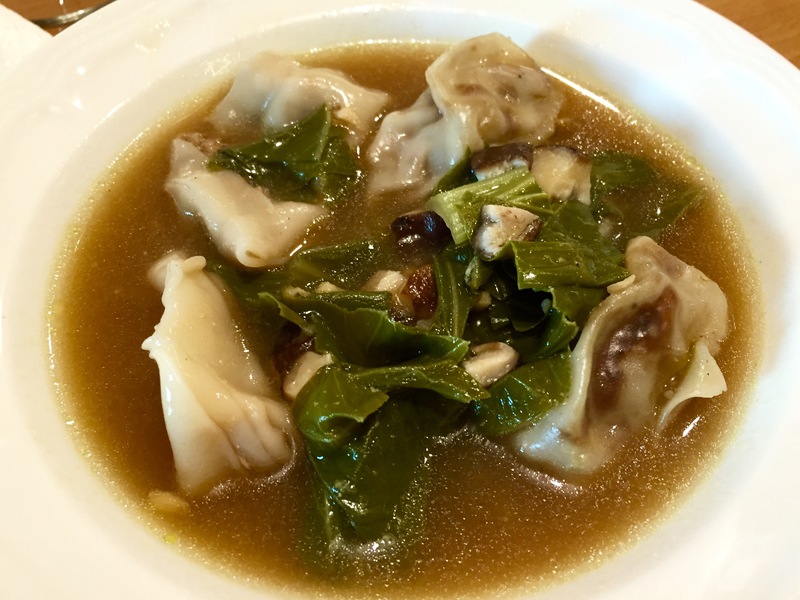 Do check my blog sometimes ..Love wonton soup so packed with flavours!